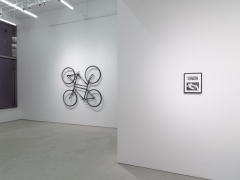 Alexander Gray Associates presented Passage, an exhibition featuring work by Ai Weiwei, Siah Armajani, Luis Camnitzer, Valie Export, Hans-Peter Feldmann, Mona Hatoum, Robert Longo, Ana Mendieta, Dennis Oppenheim, Regina Silveira, and Lorna Simpson. 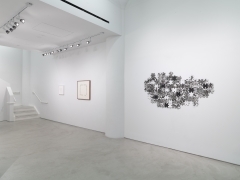 Together, the artworks trace the passage of time, collective and personal memory, histories, and diasporas. 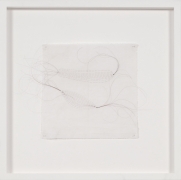 In Untitled (1999) Mona Hatoum personalizes global diaspora by tracing her flight paths between her native Beirut and her adopted London, weaving her own hair into paper to create subtle lines. The cartographic stitches illuminate the links between her own DNA and the journeys on which she and many others have embarked leaving their homeland and moving across nations, bending notions such as nation and identity. 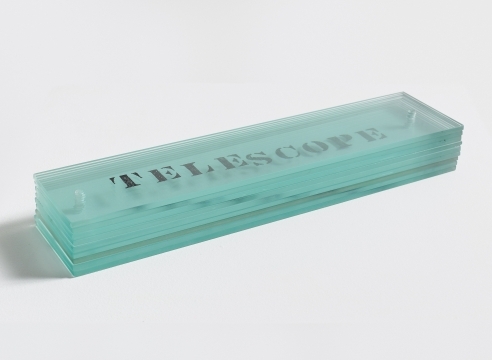 For Luis Camnitzer the space between textual and suggestive meanings allows for playful exercises aimed at shifting established notions. 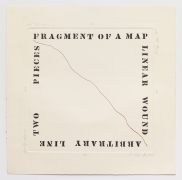 In the etching Fragment of Map (1968), a line divides the artwork’s surface diagonally, and text runs along each of the four edges so that each border of the paper suggests different interpretations for the same line. 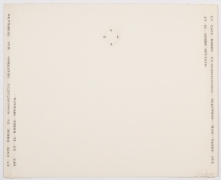 This work embodies Camnitzer’s ability to use language as a primary medium, a defining characteristic of his practice, and points to the possibility of multiple meanings of a single object or phrase suggesting how reality can be defined by ambiguity. 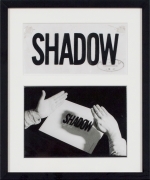 In both Valie Export’s silver gelatin photograph Shadow (1970) and Hans-Peter Feldmann’s Two Girls with Shadow (2004), shadows play a central role in challenging the viewer’s perception. 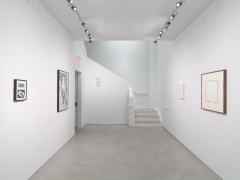 For Valie Export, whose work is dominated by Feminist concerns that initially responded to the misogyny of the art of the Viennese actionists, the inclusion of her own body is a means of expressing her autonomy. Here the shade cast by her right hand looms over the word “SHADOW,” thus performing the action expressed by the central text. Reversing this relation, Feldmann used a found photograph depicting two girls, and carefully removed the silhouette of one, leaving both of their shadows to suggest an illusion based on presence and absence. 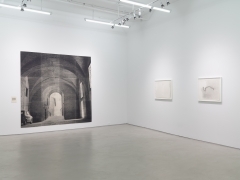 Lorna Simpson invokes personal memory in her work The Car (1995) by pairing an architectural image printed on 12 felt panels showing an arched plaza, with a narrative describing in the first-person, an unseen sexual encounter in a public space. 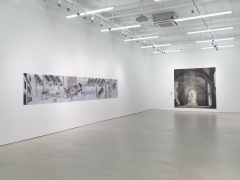 While the relationship between the experience described and the represented space is not clear, their juxtaposition points to how intimate personal memories are often associated with public consciousness and spaces. The traces of history and memory that run throughout the exhibition are central to Siah Armajani’s 19-foot drawing Written Berlin, Tomb for Dietrich Bonhoeffer and Walter Benjamin (2014–2015). 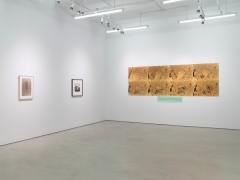 The work, part of his “Tomb Series,” pays tribute to philosopher Walter Benjamin (b.1892 – d.1940) and the theologian Dietrich Bonhoeffer (b.1906 – d.1945), both of whom died during the time of the repressive National Socialist Party’s rule of Germany. In the drawing, Armajani drafted a cityscape of early twentieth century Berlin, interweaving the artist’s own calligraphic translations into Farsi of Benjamin’s memoir, Berlin Childhood around 1900 (posthumously published in 2006) and the biography Bonhoeffer: Pastor, Martyr, Prophet, Spy by Eric Metaxas (published 2011). Armajani’s “Tomb Series” pays tribute to twenty-five philosophers, activists, poets, and critical writers who have been foundational voices to his art and ideology. In Written Berlin, Armajani situates the tomb for both Benjamin and Bonhoeffer within a rendition of the historic Brandenburg Gate. 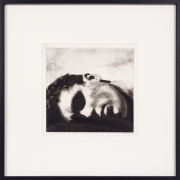 The central figure in Robert Longo’s Head (2004) is not his own, but rather a charcoal drawing of the fragmented statue of the ancient Egyptian king Ozymandias. 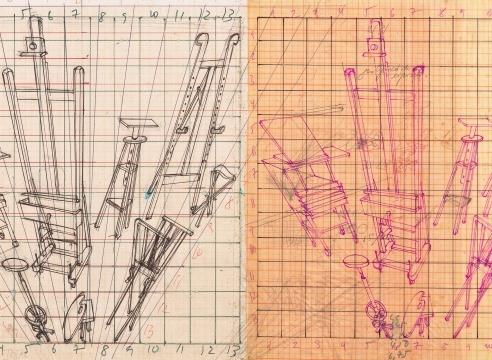 Longo’s preference for black and white stems from his interest in the tension this duality brings to documentation without over imposed narrative. The sculpture depicted as a ruin embodies the erosion of history and memory in the midst of a changing world. Ai Weiwei (b.1957) is Chinese born and lives and works in Beijing. Siah Armajani (b.1939) was born in Iran and moved to the United States in 1960 to attend Macalester College in Minnesota, where he continues to live and work. Luis Camnitzer (b.1937) is a German-born Uruguayan artist and writer who has lived and works in New York since 1964. Valie Export (b.1940) born Waltraud Lehner in Linz, Austria, and adopting the name Valie Eport, in 1967. She lives and works in Austria. Hans-Peter Feldmann (b.1941) is German-born and lives and works in Dusseldorf, Germany. Mona Hatoum (b.1952) born into a Palestinian family in Beirut, Lebanon. She lives and works in London and Berlin. Robert Longo (b.1953) was born in Brooklyn, NY, and lives and works in New York. 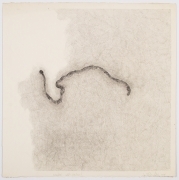 Ana Mendieta (b.1948 – d.1985) was born in Havana, Cuba, and moved to Iowa at age 12 along with her sister. She lived and worked in New York until her death. Dennis Oppenheim (b.1938 – d.2011) was born in Washington, and lived and worked in New York from 1968 until his death. Regina Silveira (b.1939) was born in Porto Alegre, Brazil and is currently based in São Paulo. Lorna Simpson (b.1960) was born, and continues to live and work in, Brooklyn, NY.